The Dark Avenger aides Commissioner Weston in landmark pulp novels by Walter B. Gibson writing as "Maxwell Grant." First, can a dead man kill? All the clues suggest that the cunning brain behind a series of murders was the first victim! 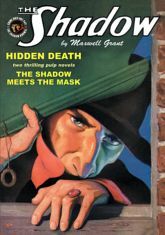 Only The Shadow can unearth the bizarre secret behind "Hidden Death," the 1932 novel that introduced Commissioner Weston! Then, the Knight of Darkness is accused of terrible crimes by a radio pundit when "The Shadow Meets The Mask." BONUS: "Murder in the Ball Park," a classic thriller from the Golden Age of Radio! This instant collector's item showcases the original color pulp covers by George Rozen and Modest Stein, classic interior illustrations by Tom Lovell and Paul Orban, and historical commentary by Anthony Tollin and Will Murray.